I had a decent day of training yesterday on Snow King. Most of the time I skin straight up the mountain to the switchback taking you to the Cougar chair. I then do intervals on the upper switchbacks. When I get to the top, I rip the skins and ski back down to that same Cougar chair switchback and repeat. Yesterday I managed to put together 8 intervals ranging from 2-8 minutes. In rando racing, the idea is to go all out…hovering just below your anaerobic threshold. Since I track my heart rate during these interval sessions, it is easy to see when I am truly going hard…or just going through the motions. 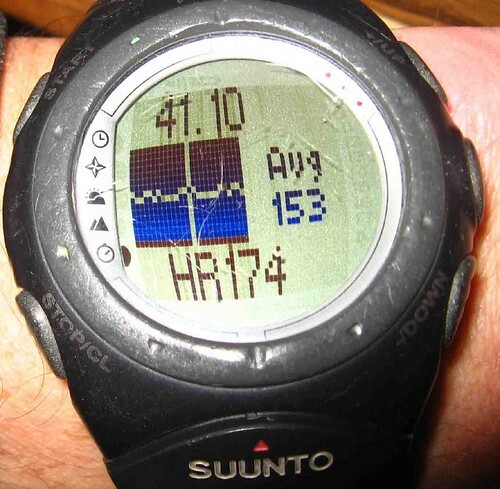 I usually use 170 bpm as an indicator of a good interval workout. The more time I keep my heart rate above 170, the harder I am pushing myself. I find combining this type of training with long, slower days to be beneficial to my fitness level. When I got to work, our shop guy Kris Quandt (who is just getting into rando racing), asked me about ascent rates or feet per minute that top racers shoot for. For US races, you really need to be able to ski 3000′ in under an hour to be competitive. Elite European racers are quite a bit stronger and can rally 4500′ off in the same amount of time. Feet per minute is something that is kinda a factor of the terrain. 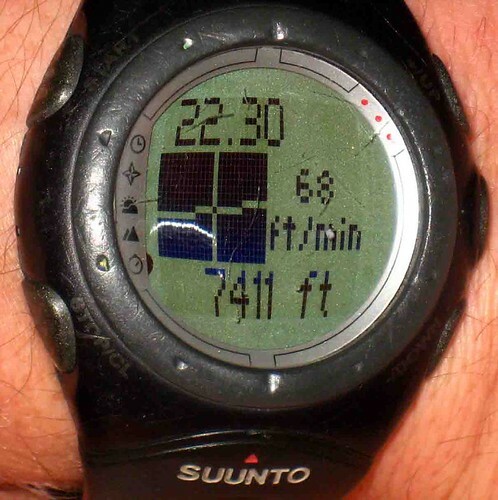 For example, in yesterday’s effort, my overall average ascent rate was 45 fpm, as tracked by my handy Suunto X6HR. This number represents an average rate of ascent during both moments of intensity and recovery. During the the intensity phase on the upper switchbacks only, the rate climbs to 60-70 fpm. Sometimes I will be doing intervals and feel like I am really pushing it, only to look at my watch and see my heart thumping in the mid to upper 160’s. This tells me that I am probably not quite as rested as I should be for interval training and am not benefiting as much as I could. Having an overall plan or goal is essential for increasing your fitness and being competitive. Well enough of that…now it’s time to ski powder. I’m heading to Wimpy’s again for some ‘worker turns’. Hopefully the weather will cooperate later in the week for some bigger and more exciting adventures. Interesting to read your training info with an eye on Rando racing. My first race is March 3 in Kirkwood, in the rec division (it’ll be my maiden voyage). I’m using my standard race build for Nordic as my rando training. I have a skate ski marathon (42K/Great Nordeen) in four weeks followed by the 32K Boulder Mountain Tour in Sun Valley two weeks later. Should cross over aerobically for rando, I figger. Do you have (or can you share)any ideas on how to speed up the trannys? I’m using TLT speeds and boots on 160 MX11’s. I don’t know how it’ll hold up, but I have old full length Coltex narrow skins with loops of bungie that attach around the heel piece. I might be able to reach down and attach/detach without binder removal. Skating should be a great tool for increasing your fitness for rando. I used to do more if it. But it is also just as important to put in time on your rando gear. 1. Lock boots to ‘ski’ position. 2. Turn heel piece to downhill mode with your opposite hand. 3. At the same time use your other hand to grab the tip loop. 4. As you stand up, pull the skin back and then step into the binding. That works for me (I’ll grab the back bungee instead after I switch to DH mode and pull…). To reattach the skins, especially without taking off the skis using Dynafits seems more challenging. What say you? I used to put my skins on without taking my skis off when racing, but I don’t do it that way anymore. I’d say 50% of the time they didn’t go on straight and I had to reapply…costing time. I learned a few tricks in Italy last year…like removing one ski as you ski into the transition on the other. Being fast at separating your skins helps a lot too. Really you just have to practice a lot to be consistently fast and nail it every time. Fast is under a minute! Nice to see I’m not the only one with a thrashed T6. Great advice on interval training. I haven’t done much of this but admidt it’s a great way to get a work out on those off days and will help me keep up with my friend (Derek W) on long tour days. It’s actually the X6HR model…and it’s my second one.